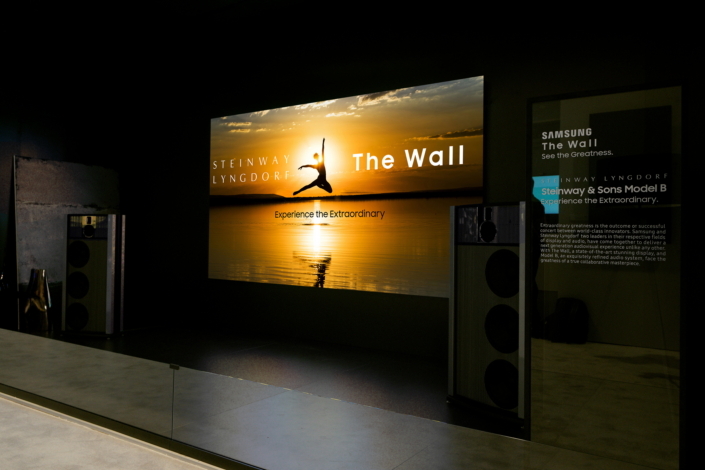 Samsung Electronics announced today its partnership with the world’s finest audio systems company, Steinway Lyngdorf, for its next generation MicroLED display, ‘The Wall’. Samsung’s impressive display and Steinway Lyngdorf’s state-of-the-art sound system are a perfect combination that provides the ultimate viewing experience. First introduced at the Consumer Electronics Show (CES) 2018, The Wall was one of the most talked-about displays of the show and continues to generate buzz within the industry. The first audio company to create a fully digital amplifier in 1998, Steinway Lyngdorf is the perfect audio partner for The Wall. Steinway Lyngdorf’s audio system became the winner of the coveted “Editor’s Choice” award from The Absolute Sound magazine for six consecutive years. Their audio system includes a sound tuning service with RoomPerfect™ room correction, which is one of the world’s most sophisticated solutions for adapting the sound system to the environment. For more information about The Wall, visit: https://displaysolutions.samsung.com/led-signage/thewall.